Gourgeist Small in game: 451 Who? Important notice! 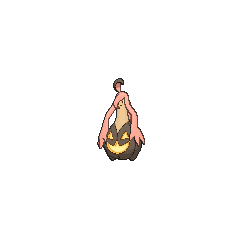 Pokemon Gourgeist Small is a fictional character of humans. Gourgeist (Japanese: ????? 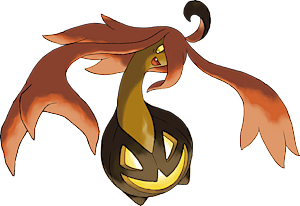 Pumpjin) is a dual-type Ghost/Grass Pokémon introduced in Generation VI. 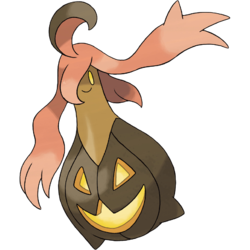 Jessie's Pumpkaboo evolved into a Gourgeist in A Festival Trade! A Festival Farewell?. Three Gourgeist appeared in A Festival Trade! A Festival Farewell?, under the ownership of Count Pumpka's steward. Only Average Size and Super Size Gourgeist can have its Hidden Ability Insomnia. 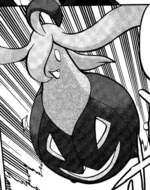 Average Size can be obtained as a Pumpkaboo with its Hidden Ability from the Friend Safari; Super Size can be obtained with its Hidden Ability as the Spooky 2014 Super Size Pumpkaboo. Gourgeist appears to be based on both gourd and modern pumpkin jack-o'-lanterns. Its multiple sizes may be a reference to the tradition of trying to grow the largest pumpkin for Halloweeen. Its upper body may also be based on the candles within jack-o'-lanterns themselves, with the curl being its wick and its hair-like extensions its dripping wax. It could also be viewed as a mere extension of the shape and the curl on top being its stem. The lower body's different color might also reference the tradition of decorating gourds with paint. Pumpjin is a combination of pumpkin and ? shin (spirit), ? jin (man), or jinn.